This archive holds all posts form August 13, 2010. Racism is bad for your health, new evidence suggests. We’ve written before about the link between racism and health. Traditionally, scholars have conceptualized this in only one direction; that is, racism is bad for people of color. African Americans, Latinos, Asian Americans who are the targets of racism are worse off than whites in terms of their health on a wide range of measures. Some of this is about health disparities rooted in income inequality, but there’s a growing body of research that points to racism as a root cause for at least part of these differences. Now, some new research suggests that racism may also be harmful for white people. In one study, Wendy Berry Mendes, Jim Blascovich, and their colleagues invited European-American men into the laboratory to engage in social interactions with African-American men or with men of the same race as themselves. The participants were hooked up to equipment that measured the responses of their autonomic nervous system while they played the game Boggle with their white or black partners. When interacting with African-American partners, the white men tended to respond as to a physiological threat, marked by diminished blood pumped through the heart and constriction of the circulatory system. However, European Americans who had positive experiences with African Americans in the past responded as though the game posed a challenge—increased blood pumped by the heart and dilation of the circulatory system. This doesn’t seem to be an isolated finding. Page-Gould conducted similar research and found that those who scored high on a measure of prejudice had increases in cortisol during the friendly interaction with a cross-race partner, but produced less cortisol when interacting with a same-race partner. Those who were low in prejudice were not stressed during either cross-race or same-race interactions. In other words, prejudiced individuals perceived partners of a different race as a physical threat, even though they were in a safe laboratory setting and engaging in a task that was structured to build closeness between the participant pairs. While this research focuses on individual level prejudice, other research points to the harmful effects of structural, institutional racism for whites’ health. The good folks at Sociological Images caught some new research by Philip Cohen of Family Inequality which demonstrates one of the many hidden costs of racism. 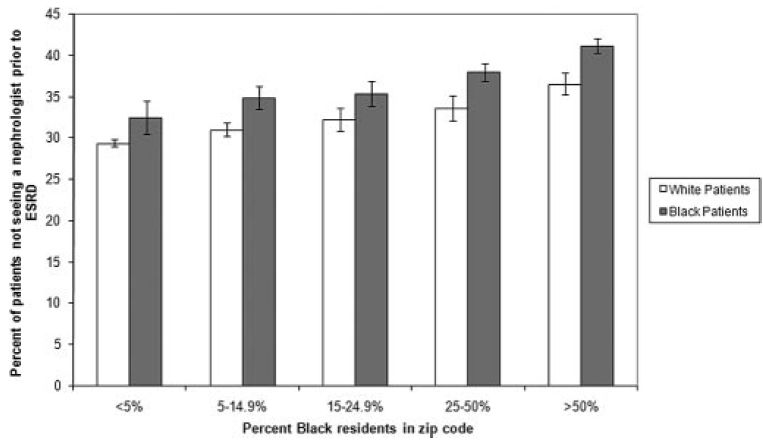 In Cohen’s recent paper published in the Journal of the American Society of Nephrology, he illustrates that in any given neighborhood in addition to the traditional way we’ve understood racism and health – that black people are always less likely to get access to a kidney specialist before their kidneys fail – there’s also another trend that’s bad news for white folks. White people living in a neighborhood with a higher percentage of blacks are less likely than whites in a predominantly white neighborhood to see a specialist. In other words, whites also suffer from the institutional racism that structures residential segregation. The intended audience member here seems to be the prejudiced white reader who, unable to avoid encounters with people of color, should learn to react differently or risk harming their health. As powerful as the imperative to health is (especially among whites), I doubt this is going to shift anyone’s approach to cross-racial interactions. As an urban dweller in the U.S. in a reasonably diverse city, I can attest to the ways that people remain racial segregated and can quite easily never interact with someone of another race. White people should worry about racism. They should worry about racism because it’s wrong. But if that’s not enough of a motivation, they should worry about it for their own damn good. Yeah, they should. We should. I’m just skeptical that self-interest will triumph where an entire civil rights movement based on moral reasoning has failed.